In an editorial for the Washington Post, Republican Senator Susan Collins has detailed why she refuses to vote for nominee and self-tanner soaked whoopee cushion Donald Trump. 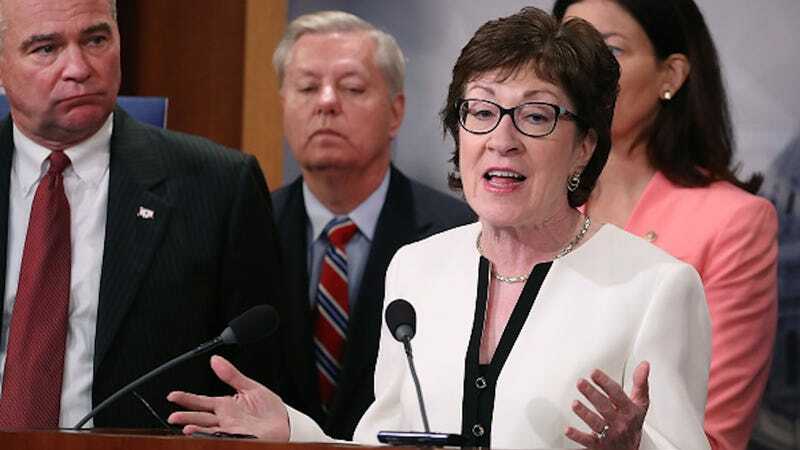 Representing the state of Maine in the Senate, Collins refers to herself as a “lifelong Republican.” She explains that her allegiance to the party makes this decision a grave one. Yet she is firm in it — firm enough to publicly denounce the Republican nominee in one of the country’s most widely-read newspapers. “With the passage of time, I have become increasingly dismayed by [Trump’s] constant stream of cruel comments and his inability to admit error or apologize. But it was his attacks directed at people who could not respond on an equal footing—either because they do not share his power or stature or because professional responsibility precluded them from engaging at such a level—that revealed Mr. Trump as unworthy of being our president. In particular, Collins refers to Trump’s mockery of a disabled reporter, his assertion that federal judge Gonzalo Curiel is fundamentally biased due to his Mexican heritage, and most recently his cruel attacks lobbed at the Khan family. But international security is another concern, and Collins expresses her doubts about Trump as a world leader and diplomat. Collins interprets Trump’s success as deriving from discontented Americans who feel alienated by legislation and economically vulnerable. Indeed, she strikes a parallel between his campaign and that of Senator Bernie Sanders. And she acknowledges that some Republicans will chide her for not supporting the party’s candidate. Yet she argues that Trump does not uphold Republican ideals that she explains have shaped her identity. “Being Republican is part of what defines me as a person,” Collins writes. Ultimately Collins does not disclose how she will vote, but she makes it clear that her rejection of Trump will not result in a vote for Hillary Clinton. Her editorial nonetheless raises the question of how many GOP members will speak out against their nominee. Will they, like Paul Ryan and Mitch McConnell, continue to critique Trump’s actions without specifically naming him? Perhaps another third candidate will emerge. Regardless, the road to hell is long, treacherous, and extremely orange.